There is a wealth of literature and products to help you save for retirement but not much is written on how to ensure you don't outlive your resources. How will you invest your assets for the years when income from work ceases? How much can you withdraw to ensure you don't outlive your savings? What happens if there is a major downturn just as retirement begins? Large fund houses in the United States such as JP Morgan Asset Management (JPAM) have begun to offer products that cater to the "decumulation" phase - that is, when the portfolio still needs to be invested, but investors withdraw an income at the same time. BlackRock expects to launch a product in the United States this year, "but the technology and framework will work in Singapore too", the group's chairman and chief executive, Mr Larry Fink, said when he was in Singapore late last year. "As people live longer, the fact that we historically thought we should be in bonds only when we retire is crazy," he noted. "But the key is not just asset allocation. Wouldn't you feel better if we can tell you how much money you'd earn every month in decumulation phase?" In Singapore, unit trusts are generally designed for the accumulation phase, although there are funds with an income objective. Some funds indicate a yield objective such as 4 per cent or 5 per cent, and distributions are made accordingly, even if it means dipping into capital to fulfil the distribution objective. The insurance sector does offer a number of options for those who want to plan for an income withdrawal in retirement. These are generally structured as endowments, where you can choose the premium payment period and the age at which withdrawals begin. You can choose the duration of income withdrawal. The endowments are par or participating products, which means the funds are collectively invested by the insurer, and policyholders typically receive a combination of guaranteed and non-guaranteed returns. The attractions of an endowment are that the policy's mechanism of smoothed returns shield investors from volatility, and there is the comfort of a guaranteed component of returns. It will be costly, however, to use endowments for the bulk of retirement income needs. As Singaporeans live longer, how many years in retirement should you plan for? 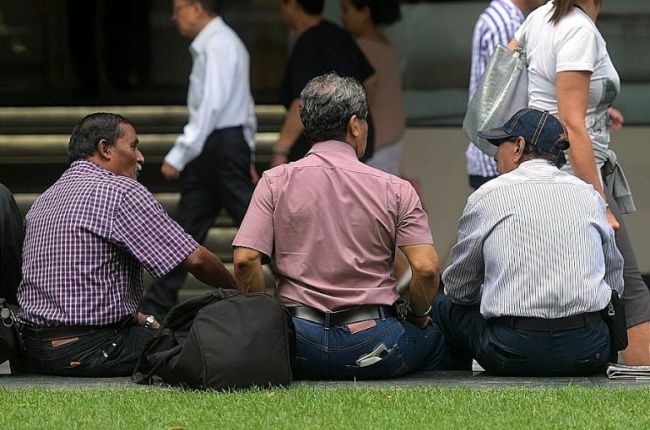 JPAM's research on Singapore retirement says there is a 56 per cent chance that a 65-year-old couple could live past 90 and a 7 per cent chance of living past 100. It says if you have a family history of longevity, you should conservatively plan for 30 years or more of living expenses. There is a silver lining, however. Ms Wina Appleton, JPAM Asia Pacific retirement strategist, says the typical rule of thumb of planning to replace 70 per cent of your last drawn pay is simply "not true". Drawing from the Department of Statistics' Household Expenditure Survey, it finds that household expenditure peaks at around 50 and begins to decline at a faster pace at 55. "The spending needs are very different in retirement. The good news is people spend less," she says. This is partly because children become financially independent and the household size becomes smaller. CPF Life alone is not sufficient to maintain your lifestyle in retirement. Hence, private savings are needed. The higher your household income, the lower the income replacement ratio, although the absolute amount to be replaced is higher. Based on JPAM's analysis at around age 60, the household expenditure is estimated at roughly $4,000 a month. JPAM has come up with an indication of how much savings you should have built up at your current age in order to maintain a similar lifestyle in retirement. The calculations assume 2 per cent inflation a year, annual returns of 5.5 per cent, annual contribution to savings of 10 per cent and a 30-year withdrawal period. For example, a 40-year-old couple today with monthly household income of $10,000 will need to have capital of $410,000. The capital sum at age 65 is estimated at about $1.4 million, which assumes a monthly withdrawal for the next 30 years at a 60 per cent income replacement ratio, discounted back to age 65. The actual accumulated sum at 65 should be around $2 million when inflation is taken into account. Providend chief Christopher Tan uses a proprietary framework RetireWell to calculate retirement needs. In its system, funds are invested into buckets. There is an income bucket for immediate income needs, which is invested conservatively. Other buckets have progressively longer horizons and can take on more risk. "What all this means is that with a higher return on investment at retirement age, and lower income needed in later years, the lump sum required at retirement is lower," he said. "But, in our experience, most clients prefer a higher income stream in the early years of retirement while they are strong and healthy, so they can do what they have always wanted to do, such as travel, while opting for a lower income later." This is the risk that you are hit with poor returns in the first few years of retirement. Based on calculations by the Capital Group, assuming an investment of US$500,000 (S$680,000) in the S&P500 and monthly withdrawals of US$20,000, the actual chronological order of return between 1999 and 2014 would result in a relatively poorer outcome, as the investor was hit with a market downturn in 2000-2002 from which the portfolio never recovered. If the return picture was reversed - that is, the return of 2014 happened in 1999 and so on - the outcome would be much different. The portfolio would end with a value of US$566,000 compared with US$213,000 in the actual chronological order. Capital Group investment director Andy Budden says: "The lesson is that a downturn early in retirement can hurt, but good returns early in retirement can really help. The reason is that so much of the person's total portfolio is held in the market at that point and so is subject to market forces. "Similarly, very late in retirement, a huge portion of the previous portfolio value has been spent or withdrawn so a market downturn can't affect it." The sequence of return risk is one reason that, when you are near or in retirement, it is prudent to have more assets in lower-risk investments. In any case, a downturn early in portfolio when an investor has begun to withdraw for income means that the portfolio has to make up for both the market decline and withdrawals. "If a strong upturn doesn't restore the portfolio, subsequent fixed-amount withdrawals will represent a greater percentage of the remaining portfolio. Often this is not sustainable and the portfolio begins a downward trend that can be irreversible," says Mr Budden. Still, Mr Bradley Vogt, portfolio manager of the Capital Group, maintains there is a place for equities post-retirement: "We think investors in retirement can't just go into cash, but they need the right types of stocks." These include blue chips with stable higher dividends. Most retirement studies posit a withdrawal rate of 4 per cent or 5 per cent. JPAM advocates a flexible approach taking into account market returns. In its post-retirement product SmartSpending in the US, Ms Appleton says the firm gives advice annually on how much can be withdrawn. "We have a target spend-down year where the portfolio becomes zero. Annually we give advice on how much we think can be withdrawn to stay on track." Mr Vogt says withdrawal rates will depend on the "total life picture". "There are fundamentals. One looks at the yield of the portfolio and thinks of an amount that corresponds to the yield. If you take out more than that, you hope capital appreciation will make up for it," he adds. "In recent times, interest rates have been so low; equity markets were high, and dividends low. If you do a 4 per cent programme, you need to hope markets keep going up." Retirees who are willing to draw down completely on the portfolio should be able to enjoy a higher withdrawal rate.